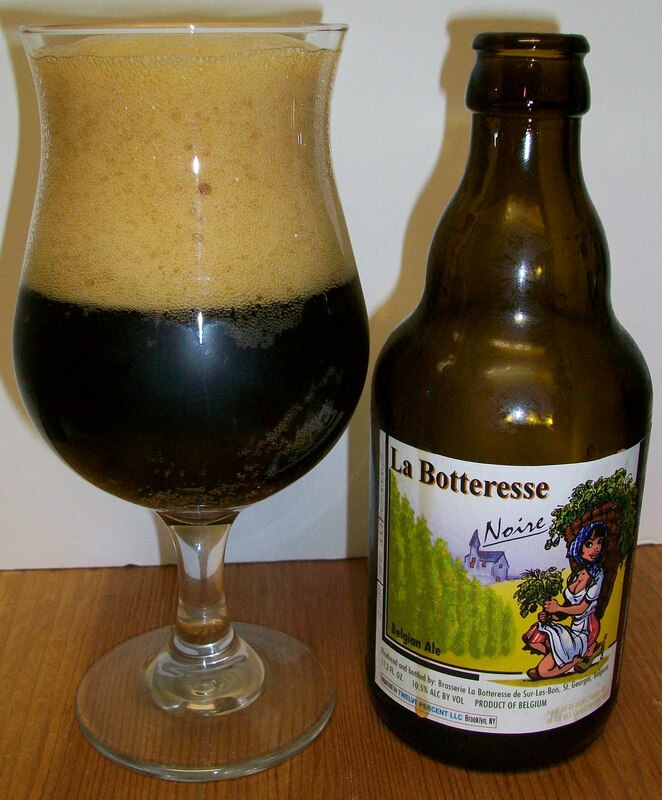 A heavily spiced Belgian strong ale, La Botteresse Noire pours near pitch black with a rich beige head. Tastes of liquorice, black pepper, burnt sugar, roasted malt, and winter spices. La Botteresse is one of those exclusives imported by 12 Percent Imports. 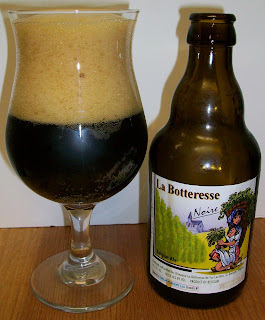 I had the La Botteresse Brune at thanksgiving and thought it was incredible. So far I have not had a bad beer imported by 12 percent. I’m going to make it a goal of mine to pick up as many of their imports as I can. The bier pours a dark brown completely opaque with a very rich tan head. The bier is highly carbonated and that CO2 release has caused the head to implode. The bubbles in the thick creamy head grew larger and larger until it collapsed. The head has diminished to a very rich creamy protective layer over the top of the beer. The nose is delightful. Rich roasted malt aromas similar to a stout with very pleasant notes of chocolate, dark fruits and some maybe a hint of coffee. This is very inviting I can’t wait to dive into this. Holy Cow, that first sip was amazing. This is the most original Belgian Stout I have ever had. It’s going to be very difficult for me to express this one. It is basically a rich, malty, creamy, stout (like) brew with that classic Flemish sourness at the end. Let me try to do a play by play. It starts out with sweet rich roasted malts on the up front on the tip of the tongue, then a complex creaminess and effervescence over the tongue in mid sip along with a building sourness. The sourness intensifies in the back-end during the swallow. The finish is fairly dry for such a malty bier. The final aftertaste is sweet dark roasted malts with a slight sourness and fruity notes. There is a malt coating throughout your mouth again similar to classic stout coating but this one is sweeter with just a hint of tart and sourness. The complexity is amazing in this brew. With every sip I seem to pick up something new and different. This is one very exquisite bier. The tasting experience just keeps going; even after what you would consider the final aftertaste you can’t help using your tongue in exploring the flavors that have coated your mouth. The flavors are really changing was it warms. We are now at 67 degrees and this is more like a Flemish Red than a Noire or Black (stout). The malts seem to be less noticed now and the sourness is more predominate. Boy did I just screw up. I just realized that I violated my number one rule on Belgian lees and I poured the lees into the class. My perception that this bier got more sour as it warmed turned out to be the lees from the bottom of the bottle. Just about two paragraphs ago I poured the rest of the bottle into the glass. Wow, now that I’m really getting to the bottom of these lees it is really getting funky. This is extremely tart and sour. It has completely taken over the malty and complexity of this bier. PLEASE! Head my advice and do not pour in the lees from the bottom of a Belgian bier into your class. I’m going to give this an A for now. I would like to try this one again without the lees. I really didn’t get a chance to see how it warmed. The lees were dumped in about half way through the review. Yet another outsatanding bier thanks to 12 Percent Imports. This is one of those Artesian Beers with outstanding craftsmanship; a real treat for a Belgian Bier lover.